Founded in 1457, the University of Freiburg is one of the most venerable universities in Germany. Each year thousands of prospective students descend on Freiburg for the annual Open Day of the University. They come to visit the city, but foremost to get a firsthand experience of the university and its departments. As the University of Freiburg is not a campus university, one of the biggest challenges is ensuring that students find their way around and see as many interesting sessions from the different departments as they wish. A small project team led by Dennis Mocigemba, the Head of Central Academic Advising at the university, was established for the development of this first time Open Day App. After in-depth research on possible app solutions, Guidebook was chosen as it offered an easy to use platform to build the app from scratch. Unlike many app solution providers, Guidebook allows users to edit and add content, as well as notifying app users – without any coding experience required, or time delay. With Guidebook’s easy to use web-based App Editor the content was uploaded and managed seamlessly into the app’s structure while giving all team members constant control over many necessary updates. Enable and motivate people to better prepare for their personal Open Day experience, by creating a personalized agenda based on more than 150 sessions offered at more than a dozen locations all across the city. Offer better orientation and navigation throughout the city by reducing the number of students “getting lost” on the way from department a to department b. Inform attendees about schedule changes on the day itself by being able to make last minute changes to the program and sending push-notification to all app users at once. By enabling visitors of the Open Day to carefully plan ahead, reduce the time needed to find locations/rooms, and stay informed about schedule changes in real time – students were certainly able to more effectively, and efficiently, manage their time on the day. 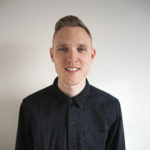 Naturally, choosing which features to utilise – and then assembling the content – is the first challenge – but once that’s complete the real challenge begins. How did Dennis and the team manage to get people to actually download the app and use it? The marketing consisted of printed, and digital flyers and posters highlighting the app. This information material was sent to all relevant schools in the surrounding area. The app was also advertised on the University website(s), and in emails sent to teachers and school staff. This multi-channel communication ensured that prospective students interested in the Open Day could easily download the app and benefit from its main features and benefits way in advance. At the end of the Open Day, Dennis and his team were pleased with what they had achieved with the app. More people were better prepared and informed, and found their sessions easier and on-time. Students were more organised due to their personalised app-schedule and an easy to use in-app navigation system. Some University professors noticed a definite increase in the number of students participating in their sessions. 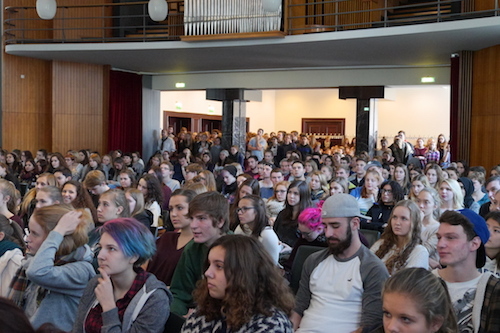 The psychology sessions – always known to be very popular among prospective students anyway – were completely overflowing, which was a welcome problem to have. The Department of Computer Science gave positive feedback on the effect of the app’s navigation also, especially because their off-center location had caused fewer visitors in previous Open Days. The ability to create their own personalised schedule was overall perceived as a huge incentive, and it explains why many of the app downloads happened 2-3 days before the actual event. Comparatively, only a few users downloaded it on the actual day itself – which seems to demonstrate that people were downloading it and personalising it beforehand, and then using it whilst offline or with limited internet connection on the day itself. As over 4000 students had used the app during the build-up to the event, and intensively on the day, they represented a highly engaged audience to capture detailed and relevant feedback from. Not only on their Open Day experience, but also specifically on their personal experience with the app. A feedback option was offered in the app at all times, and a push notification was scheduled as a follow up to be sent at 5pm the next day to ask users to provide their feedback. To get this feedback was a really valuable advancement for Dennis’s team compared to previous years. The feedback was overwhelmingly positive, and it certainly seems that students were impressed that one of Germany’s top universities had embraced technology, and displayed a pioneering philosophy during one of its most important days of the year. As the first German university to utilise the platform, Dennis and his team were able to help shape and mould the app to better serve their German speaking users. Understanding that the event organiser knows their user base better than anyone is a core principle at Guidebook – and it’s highly important for those creating non-English guides to have the ability to suggest alterations based on their localised knowledge. 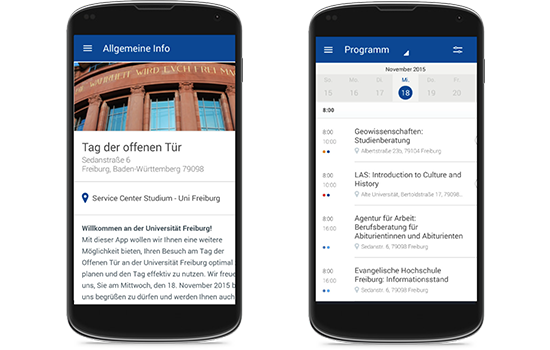 As the first German client to launch their own branded app, the University of Freiburg were happy to help with some improvements and alignments for a German speaking audience. Guidebook’s apps automatically respond to the default language setting of a device, so if a phone is set with German as the primary language, users will see different buttons and date formats. Dennis and the team helped ensure these all made sense to a native speaking audience, and certainly helped to further improve the app. Interested in creating an app similar to the University of Freiburg? Contact us today!